Color and pattern mutations occasionally appear in wild snakes, but they are often harmful to the animal. Oddly colored or patterned snakes may not be very cryptic and are therefore spotted more easily by predators. In captivity, this is not a problem, and a number of color and pattern mutations are established in some species. Burmese pythons are one such example, available in a variety of color and pattern mutations. Burmese pythons typically have grey or green to gold base coloring, with dark brown blotches on the dorsal and lateral sides of the animal. The top of the head features a distinct arrow shape, and the belly is dotted by dark spots and blotches. Burmese pythons are native to the forests and swamps of Myanmar, Thailand, Vietnam, China and Laos. Patient hunters and powerful constrictors, Burmese pythons ambush rodents, birds and mammals -- suffocating their prey before they consume it. Female Burmese pythons grow larger than males. Females deposit large clutches of eggs, and then coil around the eggs for the duration of incubation. Hatchling Burmese pythons are completely autonomous and look like small versions of their parents. The first albino Burmese pythons were discovered in the early 1980s. Python breeder Bob Clark obtained one of these animals and produced the first ever captive bred albino Burmese python in 1986. Though popularly called albino, these snakes technically exhibit amelanism, lack of pigment. A true albino animal has no pigment, whereas these snakes still have yellow and red pigments; only their black pigment is missing. Young albino Burmese pythons have bright red eyes and a white base color, topped with yellow and red markings. As they age, these markings become less distinct. In late 1995, another mutation of the Burmese python was found in the wild. These snakes were colored typically, but their pattern was different. Covering the animals in small, irregular dark blotches on the dorsal and lateral sides, the new mutation was coined "granite"; it has also proven to be a recessive mutation. In addition to the irregular dark spots, granite Burmese pythons also feature a patternless belly, indistinct head markings and all of their light colored dorsal scales have a dark spot in the middle. For a recessive trait to be expressed in an organism both parents must contribute the mutated gene to the offspring; only animals with two copies of a mutated allele will display the mutation. As both the granite and albino mutations are inherited in a simple recessive fashion, it is difficult to produce this combination. The first step in the process is to breed an albino snake to a granite snake. The young from this clutch will look normal, but carry the genes for both mutations. These offspring -- termed double heterozygous -- are then bred together. The resulting offspring represent a variety of genetic combinations. Statistically, only one in 16 babies will display both the albino and granite mutation; the other 15 snakes will display varying combinations of the genes. Albino granite Burmese pythons display both mutations. Like albinos, they have red eyes and like granite pythons, they have patternless bellies; they are essentially red, yellow and white versions of the granite mutation. 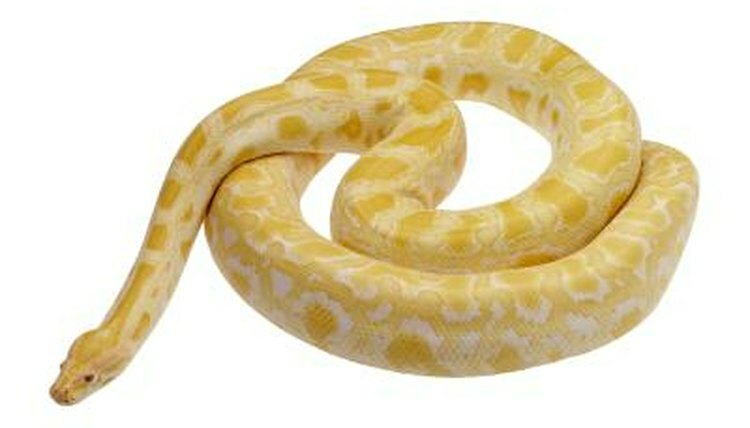 Over time, the markings fade somewhat, and they essentially become white and yellow snakes. Burmese pythons (Python bivvitatus) are among the largest snakes in the world, reaching more than 18 feet and 300 pounds. As adults, they require very large cages and high quantities of food -- which for adult Burmese pythons means rabbits, chickens or ducks. Owning one of these animals requires significant time, skill and resources beyond the capabilities of many would-be keepers. Potential owners must consider all aspects of Burmese python care before purchasing such a large and potentially dangerous animal. Why Do Albino Animals Have Pink Eyes?